One of the most glaring gaps in most people's knowledge is their almost total ignorance of the thousand years of Byzantine civilisation, without which neither western civilisation as we know it nor that of Russia and eastern Europe could have existed. They have heard of Constantine; they know that at some time or another he transferred the capital of the Roman world from Rome on the banks of the Tiber to Constantinople on the shores of the Bosphorus, though few of them have much idea of when or why he did so. Most people have also heard of Justinian, though they are very vague as to when he lived and what he did. lastly, the name Theodora is faintly familiar and has slightly naughty associations; but that is all. the rst, as Hamlet said in a very different context, is silence. This remarkable ignorance is at least in part the fault of Edward Gibbon, paradoxical as that may seem, for he wrote the first and in many ways the greatest history in the English language of Byzantine civilisation, but he was so blinded by the enlightenment of his age, that in the process, he misrepresented Byzantium and misjudged it more completely than anyone else, and was thus responsible for the universal contempt in which all things Byzantine were held for over a century, and the almost equally universal neglect with which they were treated. Happily, however, within the last hundred years there has been a change of heart amongst historians, many of whom have reassessed the Byzantine achievement, rejecting gibbon's judgement of it. At the same time, the ease of travel which everyone now enjoys and the excellence of modern means of reproducing paintings and mosaics in colour have led to the rediscovery of Byzantine art, which is probably more widely and deeply appreciated today than it has been since the days of men like Cimabue and Giotto, and this in its turn has led to a rebirth of curiosity about Byzantine civilisation and history. Unfortunately, this curiosity is not very easily satisfied; few people can return to the original Greek sources of information, even when they are easily accessible, which with a few exceptions they are not; meanwhile, most of the standard works on the subject in English, French, and German, let alone those in Russian, are either difficult to obtain or rather daunting in appearance by reason of their size, their obvious erudition, and sometimes their cost. So many ordinary, interested, and intelligent readers decide that Byzantine history is not for the likes of them; they would probably enjoy it greatly if they read it, but they seldom do so, and this is a pity. detailed information about her personally and about the events of her day in a large number of works, and he was by no means the only man to do so. Several other Greek historians, notably John Malalas, covered the same period, as did the Syriac historian John of Ephesus. Their works, as well as a mass of other contemporary documents of one kind or another, have been the sources to which all modern historians have returned, and the results of their labours have been legion. I have listed many of these modern histories, both of the particular period covered by this book and of Byzantine civilisation in general, in the bibliography at the end of this book, but I must acknowledge here my debt to two men: the French historian, Charles Diehl, whose biography, Theodora, Imperatrice de Byzance, together with his history of her time, Justinien et la civilisation byzantine au VI siecle, and his many other works are still invaluable, even though most of them were published sixty or more years ago, and Diehl's equally great English contemporary, J.B. Bury, whose Later Roman Empire is not only a classic but also a mine of information about the life, times and contemporaries of both Justinian and Theodora. Of course, I am in the debt of many others too, but they must forgive me if I do not mention them all by name here. As for my own book, it is in no way a work of original scholarship, as any historian will be able to see at a glance; I have picked the brains of other scholars and raided their works unmercifully, and I am grateful to them for the wealth of detailed information and local colour which they have provided If my book manages to rouse the enthusiasms of some people for the Byzantines and their achievements, and thus encourages them to take a greater interest in one of the world's greatest, yet most misunderstood and undervalued civilisations, I am sure that its real historians will forgive me for raiding their territory and invoking their assistance in the process. Theodora was a Byzantine courtesan who rose from the gutter to the throne. As a story hers is as romantic and improbable as that of Cinderella; and yet it actually happened. The Byzantines were a remarkable people, and they produced some remarkable women, but by an standards Theodora must rank as one of the most remarkable of them all. her name has been blackened by her enemies, including one malicious historian and a host of churchmen, and some of the scandalous stories they told about her may have been partly true; nevertheless she also had great qualities, and it is time that the record was put straight and the balance against her redressed. 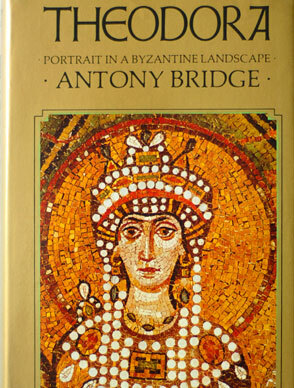 Antony Bridge's artistic and theological background and lifelong interest in Byzantium fits him particularly well for the task and he has produced a scholarly and outstandingly entertaining biography. was devastated by bubonic plague. yet she triumphed over every adverse circumstance, rising from her humble beginnings as a dancing girl to become a great Empress. Feminine and feminist to her finger tips she was a woman of rare distinction and an unforgettable human being.